A week ago tonight, Google pushed out a small, almost unnoticeable Panda refresh. Most SEOs didn't notice but we did notice something and reported the flux in our May 2012 Google report. We're continuing to iterate on our Panda algorithm as part of our commitment to returning high-quality sites to Google users. This most recent update is one of the over 500 changes we make to our ranking algorithms each year. That is a lot for a couple weeks. 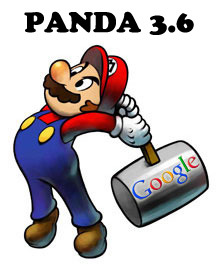 We had negative SEO debates, a parked domain bug, Panda 3.5 refresh and Penguin slap us all in a very short time span and then 8 days after the Panda 3.5, we had a Panda 3.6 refresh. Why so soon? Why only 8 days between 3.5 and 3.6 when we typically see 6 weeks or more between Panda refreshes? Google has not told me why. Maybe there was an issue? Maybe Google often does these minor updates and no one really notices or asks Google? Who knows but there was a Panda refresh about a week ago on April 27th and I wanted to document it.